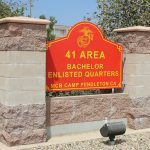 When San Juan Capistrano, CA activist/resident Kim McCarthy recently contacted us with a request to help out the homecoming Marines of MCAS Camp Pendleton. She went on to explain that her friend/neighbor Marc Franz was looking to donate his used Olhausen pool table to a good cause and needed a billiard mechanic who would donate his pool table moving services. I patriotically replied, “Yes!” Kim immediately contacted Mamie Yong Mayhort founder of Homefront America, who in turn reached out to her people at Camp Pendleton. 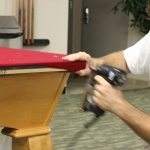 Mamie also arranged to have three Marines on site to help me with the loading/unloading of the heavy, three piece slate Olhausen pool table. I actually didn’t know what brand pool table I had volunteered to move or what part of the donor’s home it was located in. So when I arrived at Marc’s home and learned that it was in an upstairs guest room I was glad that there were three young Marines there to help move the heavy pieces of slate. 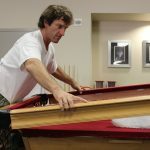 Although I represent Connelly Billiards, the archrival of Olhausen Billiards and despite their inflated prices, Olhausen consistently produces a pretty darn good pool table. 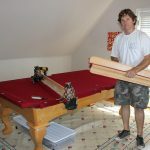 Their pool tables are generally a pleasure to disassemble, move and/or setup, as was the case with this Olhausen.